CCC – Feeling the bite? Our Coronado Cooling Center is aware of the mosquito endemic. There are new forms of tiny mosquitoes some that target those tasty ankles. Be aware and take precautions – socks! Here is the mosquito weather report. 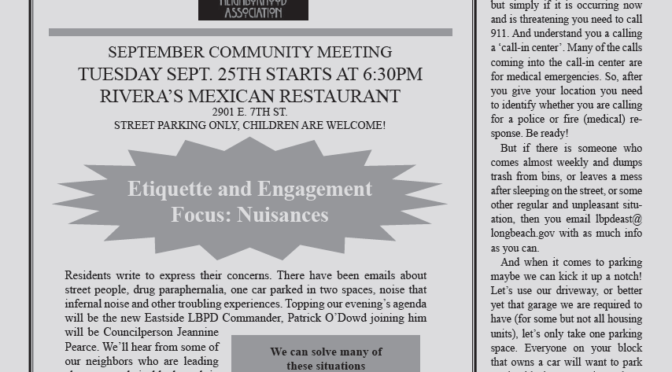 Community Meeting – Etiquette and Engagement: Ways to address Nuisances. We’ll distinguish ways to solve chronic nuisances. Council Member Pearce and Commander O’Dowd will be on hand. Plus residents who are engaging in quality of life actions. Calendar and attend Tuesday Sept. 25th 6:30-8pm at Rivera’s Mexican Restaurant (E7th and Gladys). Background on some nuisance issues – You’ll have your own, as well. Newsletter on the way! Soon to be at your doorstep! Always good with morning coffee or afternoon tea!